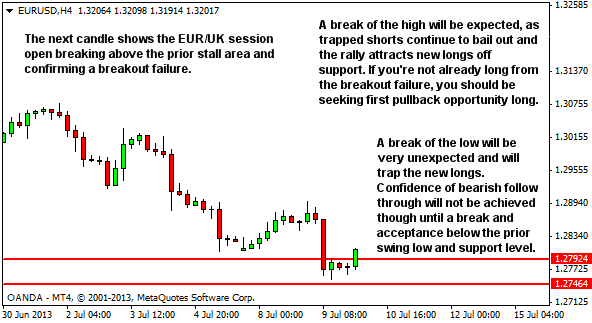 There are various analysis tasks that must be completed upon first arriving at our charting platform each day – examination of higher timeframes to create a support and resistance framework; examination of market structure in order to identify the potential environment (trending or ranging); and examination of any pre-session data that may be significant to our upcoming session (trend and bias). But analysis does not end there. Ongoing analysis requires a bar by bar reassessment of our previous analysis, as more price action unfolds on the right hand side of our chart. New data will arrive, one candle at a time. Each new candle being a source of information; most of which will offer nothing new or relevant; but some of which will alter our analysis, either strengthening or weakening our assessment of market sentiment and future price direction. 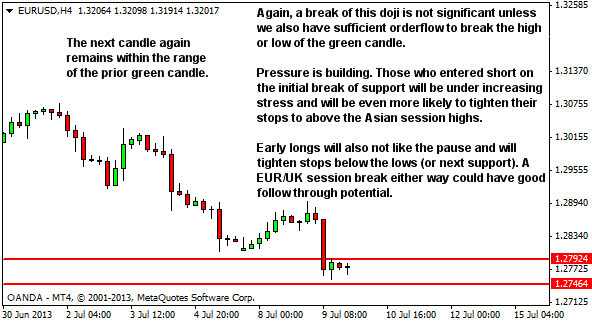 Every new candle is potentially significant. Failing to monitor price with each new candle means we will be forced to be reactionary – surprised by price action developments and chasing setups and entries after they've become obvious to the crowd. Ongoing monitoring ensures we maintain focus and maintain situational awareness – staying ahead of the current price action – assessing where it's likely to travel, how that will impact upon decision making of other traders, and where that will create trade opportunity. 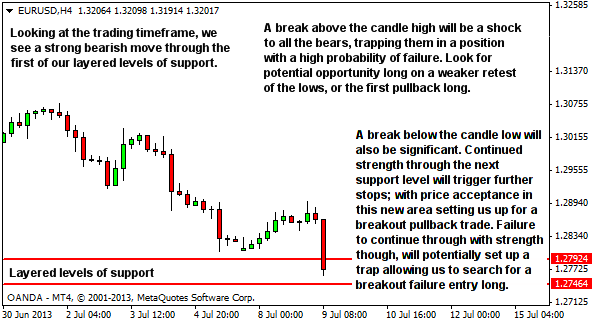 Ongoing price action analysis can be conducted on all timeframes, however our main interest will be the trading timeframe. We question EVERY candle to determine what it means with regards to the shift in sentiment between the bulls and the bears; and whether or not it changes our expectations for the future. 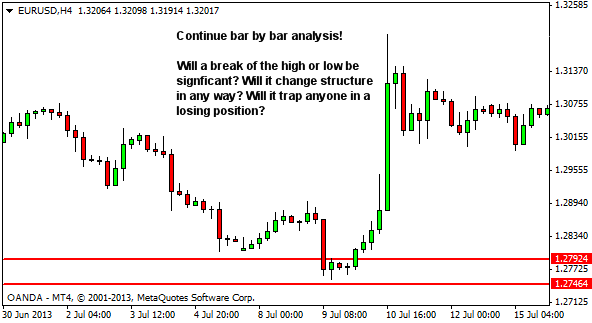 Bar by bar analysis as I do it is a four-step process, and is outlined in the YTC Price Action Trader. But if you want a basic technique that allows you to somewhat achieve these aims, the following single question can help. 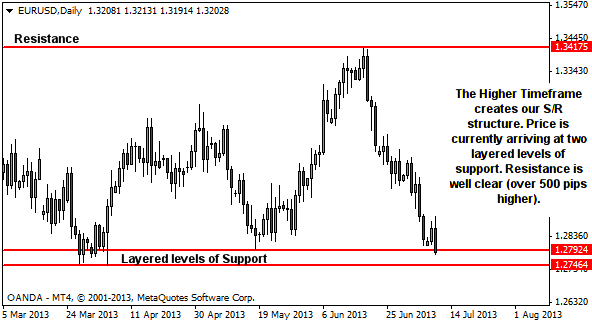 Will a break above this bar's high or low be significant in any way? What do I mean by significant? Simply… will it signal any potential change in structure? And will it increase the stress levels of any traders? 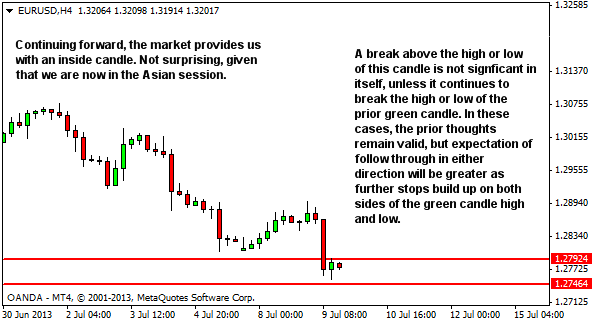 Is the candle high or low an obvious place for positioning of stops. Recent articles on trap entries, here and here, are particularly relevant. 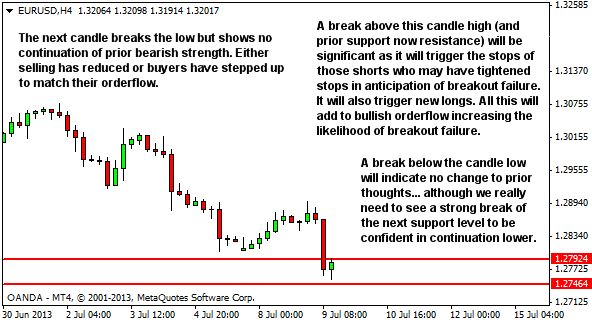 It's a simple way to keep your thoughts ahead of price, seeking those situations where traders are trapped or under stress. Seeking those situations where an edge can be found in the market. If you're interested in my four-step process, see the YTC Price Action Trader. Otherwise, try applying this simple one-step method to your current strategy. Keep your thoughts ahead of price, so that you're anticipating opportunity rather than reacting after it's already passed by.